STEAM vs. STEM: Why we need to put the arts into STEM education. Why we need to put the arts into STEM education. Bud May, a teacher at Boylan Catholic High School, shows a prosthetic hand made for Kylie Wicker, in Rockford, Illinois, on May 2, 2014. The Engineering Graphics class at the school took on the project of making a prosthetic hand for Wicker, who was born without fingers on her left hand, using a 3-D printer and instructions that were posted online. On Wednesday, June 17, Future Tense—a partnership of Slate, New America, and Arizona State University—will host an evening event in Washington, D.C., on designing the 21st century. For more information and to RSVP, visit the New America website. Imagine a high school dance class in session. You might envision an open studio, pupils all in a row, lined up to practice their pliés and jetés at the command of their instructor. Not so much at Boston Arts Academy, where art is “central to learning.” For one class project, a BAA dance student prototypes her own “electroluminescent costume,” which uses electrical currents to light up the fabric. She creates the costume from sketch to reality, complete with working circuits, and all with the help of the school’s modeling software and a 3-D printer. That’s STEAM in action. “STEAM” takes the standard STEM formulation (science, technology, engineering, and math) and adds an A for arts. And, well, it seems to be gaining steam. In May alone, 27 school districts and programs in Pennsylvania were awarded $530,000 specifically for the development of STEAM programs and facilities, and VH1’s Save the Music Foundation held a high-profile event to promote STEAM. As STEAM has become increasingly prominent, some have argued that the general addition of an “arts” component distracts from the focus on the hard sciences. 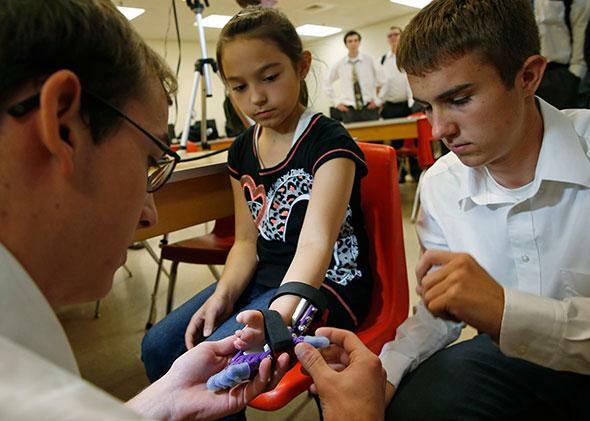 Lloyd M. Bentsen IV, a researcher with National Center for Policy Analysis, says STEM already suffers from a major problem with student engagement, and the focus on changing STEM to STEAM would distract from the issue. But the STEAM movement isn’t about spending 20 percent less time on science, technology, engineering, and math to make room for art. It’s about sparking students’ imagination and helping students innovate through hands-on STEM projects. And perhaps most importantly, it’s about applying creative thinking and design skills to these STEM projects so that students can imagine a variety of ways to use STEM skills into adulthood. As an A student with a love of drawing and crafting, I spent my K–12 years being told art was a nice hobby. Art skills had nothing to do with science or math success, and engineering was something you went into only if you did well in math and science first. Succeeding in STEM subjects, which weren’t called STEM at that point, seemed more important. When I was in high school in D.C., there was never much choice between taking studio art and calculus—if you were clever, you took the latter, knowing that anything with art in the title was sure to be useless to your career and college aspirations. “Design” was never an offered subject, much less a subtopic for discussion, and I never considered it as a career path, because I had no idea it was a career path. It wasn’t until after college, when I found myself creatively dissatisfied and wondering why I majored in economics, that I came upon a continuing education class called Product Design. That class experience was something totally novel to me. Every class meeting was about problem solving, collaborating, and generating ideas. It was about using a variety of skills and subjects to invent products. We used math without thinking about the numbers, from scaling to modeling products to meticulously drafting prototypes with precise angles and measurements. “Design thinking” became my way of approaching everything that year—I couldn’t go to happy hour without asking my friends what they thought went into creating the bar stools they sat upon. I was, in short, a little insufferable. I became fascinated with that way of seeing the world, of owning a creative process while using technical skills. The notion of using a design process stuck with me as I segued into math teaching and tutoring, in which I began designing curriculums for students with different learning issues. Taking that first design class led me to not only teach better, but eventually pursue education as a career. Arguing that the arts and science should and could remain totally separate misses the point. This is not about cultivating more artists or diluting STEM—it’s about creating STEM students who think creatively and remain engaged in their learning. True, not everyone will want to or should go into STEM, but the point is to reach those who would contribute in STEM fields but may be turned off by a difficult math class, a boring biology teacher, or not seeing people like them represented in those fields. How many potential scientists are we missing because we continue to push the same STEM curriculum even as money pours in from STEM grants? How many who aren’t part of the “priesthood” of scientists still deserve to be given another chance to be successful in STEM? STEAM critics are right in a way—there is a major student engagement problem. But it is mostly in terms of diversity in the STEM fields. This is the very problem being addressed by STEAM. Anne Jolly argues in Education Week that STEAM uses the arts as an “on-ramp to STEM for underrepresented students.” STEAM uses design methods to approach STEM subjects creatively and make them real-world-relevant to all students, not just those already interested. As you can see, students learning with STEAM often use 3-D printers and other high-tech “maker” materials that are hardly traditional art supplies. What the movement really does, rather than simply add art, is work on developing high-order design and engineering skills while allowing students to innovate, invent, and succeed on their terms. It forces students to produce original work using STEM but gives them the choice of how to do so and what to produce, which makes all the difference. Rather than focus on rote memorization or mastery of separate topics, STEAM uses project-based teaching to holistically foster students’ skills in creativity, design thinking, tech literacy, collaboration, and problem solving. This sets students up for success in STEM, especially for those who might not seem to be naturally gifted in technical areas. Ultimately, STEAM is people-centric, not subject-centric; it puts student personality and individuality at the forefront. With STEAM, the pressure is off to become a scientist or engineer—you can be a designer, digital artist, coder, art director, and scientist and engineer all at the same time. STEAM says we can be better engineers by learning how to think artistically, and we can re-engage artists with science by letting them see how STEM can work in the arts. It’s infinitely more exciting, especially in an increasingly interdisciplinary and digital world. In STEAM, creativity is the central tenet. It not only revives and modernizes STEM, it actually addresses, through real-world projects, why the STEM subjects should matter to everyone. And that’s how we should all be learning.